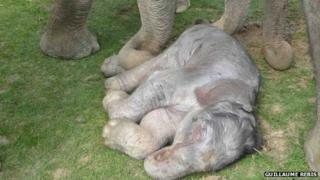 The mystery of the elephant's long pregnancy has been unravelled by scientists. A quirk of biology allows the unborn calf to develop in the womb for almost two years, giving it the brain power it needs to survive from birth. The research, detailed in Proceedings of the Royal Society B , will help elephant breeding programmes in zoos. It may also lead to the development of a contraceptive to control wild populations of elephants in Africa. Dr Imke Lueders, of the Liebniz Institute of Zoo and Wildlife Research in Berlin, Germany, told BBC News: "It is very important to study the reproduction of elephants. "The increased knowledge that we gained through this research can help in the future with elephant breeding management because we have an idea of how the pregnancy is maintained." Elephants are highly sociable mammals with a high level of intelligence similar to that of great apes and dolphins. They have the longest-known gestational period of any animal, lasting up to 680 days. Elephants are born with an advanced level of brain development, which they use to recognise the complex social structure of the herd and to feed themselves with their dextrous trunks. Until now, the biological processes behind the mammal's marathon pregnancy has not been fully understood. But the advent of advanced ultrasound methods has given veterinary scientists a new tool to monitor elephant pregnancies in more detail, as they seek to improve breeding programmes in zoos, including elephant IVF. Seventeen African and Asian elephants at zoos in the UK, Canada, US, Australia and Germany, including ZSL Whipsnade and Twycross Zoo, were examined in the study. The research, published in the Proceedings of the Royal Society B , shows the elephant has a unique cycle of ovulation. Dr Lueders said the extended pregnancy was "due to a novel hormonal mechanism, which has not been described in any other species of animal". Ovulation is triggered by two surges of the reproductive hormone LH (luteinising hormone), while the pregnancy is maintained by hormones secreted by several ovarian bodies known as corpus lutea. The knowledge will help conservation efforts to help elephants in the wild, as well as in zoos. Dr Dennis Schmitt is Director of Research and Conservation at The Ringling Bros Center for Elephant Conservation, which aims to safe-guard the future of the Asian elephant. Commenting on the study, he said: "Not only is the long gestation of elephants unusual (22 months), but the long birth interval (4-5 years between calves) along with a long interval between generations of elephants (average approximately 20 plus years), complicates efforts to manage declining populations of free ranging endangered elephants." The research may also help scientists develop a contraceptive for elephants. While some species of elephant are endangered, other populations have grown, leading some to advocate controlling numbers by contraception or, more controversially, culling.